Astronaut John Young, who walked on the Moon during Apollo 16 and commanded the first space shuttle mission, died Friday, Jan. 5, 2018, at the age of 87 from complications of pneumonia. Young began his impressive career at NASA in 1962, when he was selected from among hundreds of young pilots to join NASA's second astronaut class, known as the "New Nine." “Today, NASA and the world have lost a pioneer," acting NASA Administrator Robert Lightfoot said in a statement. "Astronaut John Young's storied career spanned three generations of spaceflight; we will stand on his shoulders as we look toward the next human frontier. “John was one of that group of early space pioneers whose bravery and commitment sparked our nation's first great achievements in space. But, not content with that, his hands-on contributions continued long after the last of his six spaceflights -- a world record at the time of his retirement from the cockpit." After hearing President Kennedy's bold proposal in 1961 to land a man on the Moon and return him safely to Earth, Young said knew what he had to do. "I thought returning safely to Earth sounded like a good idea," said Young, who stood on the Moon, drove 16 miles in a lunar rover and spent three nights on the lunar surface. He is the only person to go into space as part of the Gemini, Apollo and space shuttle programs and was the first to fly into space six times -- or seven times, when counting his liftoff from the Moon during Apollo 16. Young was born in San Francisco, California. His family moved to Georgia and then Florida, where he lived for most of his childhood along with his younger brother. As a boy, Young's favorite pastimes were building model airplanes -- the first hint of his passion for aeronautics -- and reading. "My grandpa taught me how to read," said Young. "I read the encyclopedia when I was five." His father, a civil engineer, was Young's role model. Young graduated from Orlando High School and then earned a degree in aeronautical engineering from Georgia Tech, where he graduated with highest honors in 1952. Following graduation, he joined the Navy and, after a year's service aboard a destroyer, was sent to flight training. He flew fighter planes for four years, then completed test pilot training and served three years at the Navy's Air Test Center, where he heeded the president's call to go to the Moon. In March 1965, Young made his first flight as an astronaut, joining Gus Grissom on Gemini 3, the first manned flight of that program. As Young prepared, a sense of obligation overruled excitement or any other emotion. "We were just thinking about doing the job right," Young said. Young commanded the Gemini 10 mission in July 1966. He and pilot Mike Collins rendezvoused with two Agena target vehicles, and Collins did a spacewalk to retrieve a micrometeorite detector from one of them. In May 1969, he served as command module pilot on Apollo 10 and flew all the way to the Moon with crewmates Tom Stafford and Gene Cernan. The crew scouted landing sites from lunar orbit and rendezvoused the lunar module and command module in a full dress rehearsal for the Apollo 11 landing two months later. Young made a return trip to the Moon as commander of Apollo 16 in April 1972. With Ken Mattingly orbiting above in the command module, Young and lunar module pilot Charlie Duke landed in the Descartes highlands. "The moon is a very nice place," Young said. "When we landed, we were 20 minutes behind. Because time on the Moon was so precious, what I remember most is trying to catch up." Young and Duke set up scientific equipment and explored lunar highlands in the rover. The mission returned more than 200 pounds of Moon rocks gathered from three geological outings. Young's career was full of firsts, none more notable than in April 1981, when he commanded Space Shuttle Columbia on its -- and the Shuttle program's -- maiden flight, STS-1. It was the first time a piloted spacecraft was tested in space without previous unpiloted orbital flights. Young and pilot Robert Crippen accomplished more than 130 flight test objectives during their almost 55-hour mission. In addition to his six spaceflights, Young was a member of five backup crews. He's logged thousands of hours of training and flight time, including a total of 835 hours in space. 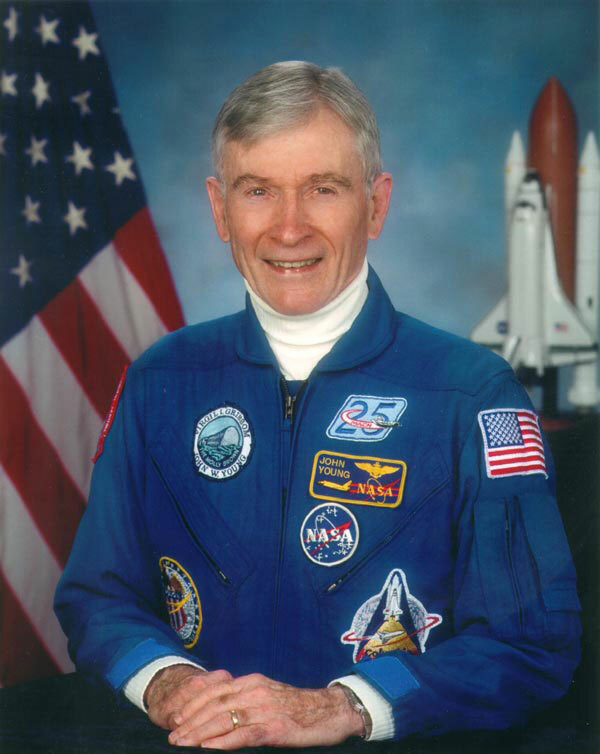 Young's numerous awards and special honors included the Congressional Space Medal of Honor, three NASA Distinguished Service Medals, the NASA Outstanding Leadership Medal, two Navy Distinguished Service Medals, three Navy Distinguished Flying Crosses, the Georgia Tech Distinguished Young Alumni Award, the Exceptional Engineering Achievement Award and the American Astronautical Society Space Flight Award. "I've been very lucky, I think," Young said at his retirement from NASA in 2004. As to which moment was most memorable, he says simply, "I liked them all."